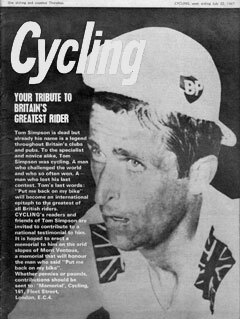 The shocking image of Tom Simpson and the caption “Your tribute to Britain’s greatest rider” sums up the summer of 1967 for anyone who was a cycling fan at the time. Imagine the shock of one day having a British cyclist riding for glory in the biggest event in the world. Then for it all to collapse - leaving just words, pictures and memorials. This was over 40 years ago but people still talk about, write about and remember the person, the place and the date. What can I add when so much as already said and written? Not a lot. 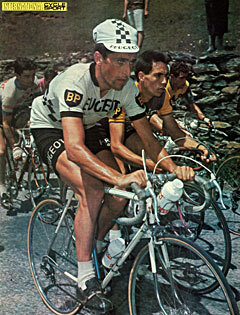 I was not on Mont Ventoux that day nor indeed at any stage of the 1967 Tour. I was, however, able to see some of the British team members earlier that year, during a cycling trip to Belgium. Not having pro team backing or entries to major events they were racing in kermesses as preparation for the Tour. Peter Chisman, Albert Hitchen and Colin Lewis were spotted flashing around the streets of a Belgian town - each hoping that it would help them in the task ahead. But my impression was that this was a very hard way to gain form - especially riding against tough kermesse specialists routinely jumping kerbs, cutting corners and sprinting for lap after lap. Hardly ideal training for a grand tour. 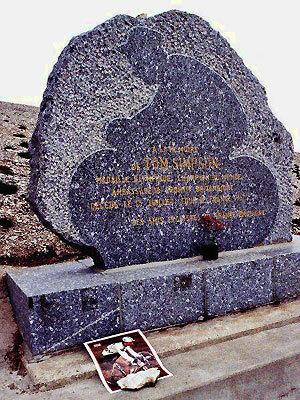 And I was able to see Tom during some of his racing trips back to UK. In the London to Holyhead and at Manchester’s Fallowfield track. It was there, one rainy day, that he kindly signed a photo for me. The well-known photo that was a supplement to Miroir du Cyclisme. It was not until many years later that I made it to Mont Ventoux. And then I was, at last, able to leave a copy of the photo as my contribution to the memorial’s collection of cycling offerings.